Frederick Noble is the author of Vegas Apocalypse, a near-future, post-apocalyptic sci-fi thriller. AJ Smith crash lands in Las Vegas where warring factions battle for control of the dying town. Other efforts include role playing games, party games, and more novels. Details can be found at www.pangenre.com. 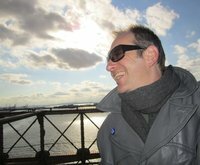 In addition, Frederick writes music reviews and tall tales for www.degeneratepress.com. To ask Frederick Noble questions, please sign up. Couldn't get through it. Dull. Henry Miller is one of those influential people I *want* to like, but no matter how many of his works I read I just can't get into him.